Resurrected from the PC original released in 1994, Theme Park on the Nintendo DS places you as the designer, developer and manager in a realistic and believable finance-based simulator. 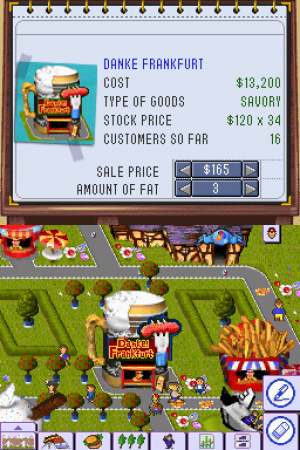 Created by video game legend Peter Molyneux, Theme Park has a very simple concept on the surface but when you persevere with the title you will find there is a great amount of intricate detail and depth to explore. The game plays very similar to the original classic albeit with a few bells and whistles added to spruce things up a little. When you start a new game you are asked to name your park and from that point you are pretty much in control. New gamers are given the ability to take a short (but recommended) crash course in the art of park building while experienced players can get straight into the action. You start your park building operation in “merry olde” England, whereby you need to meet a number of low level requirements before you are able to move on. Each time you meet the specifications set by a country you are able to sell your park and move to a new part of the world to build a different park. It’s a touch disappointing that you cannot revisit parks that you have created previously but it is worth mentioning that once you have built your park to its maximum potential there is not much need for replaying it. Still, it would have been nice to be able to at least take a look at all the other parks you developed, purely for “showing off”. When you start a new park you are simply greeted with golden gates for the entrance and a short path. 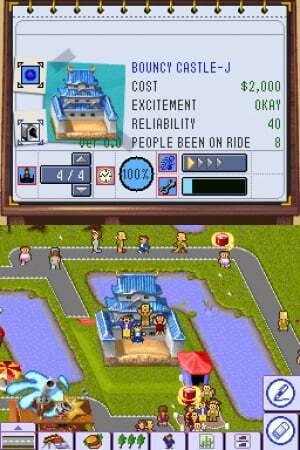 In Theme Park DS your stylus and the touch screen takes care of the construction side of the game, whereby the D-pad allows you to move around the map. Using the stylus to place rides and paths should be intuitive but due to the awkward sideways angle of the Theme Park environment sometimes placing objects can be frustrating and require more thought than it should. That being said though using the touch screen is probably quicker than using the D-pad once you get the hang of it and therefore while annoying at first the controls will grow on you. Theme Park is an incredibly dense title of which you won’t achieve the best results without perseverance and patience. There are three main types of object you can position on your park: a ride, a shop and decorations/services. Your park will not be successful unless you plan the placement of these objects correctly. 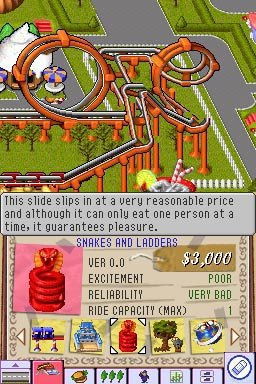 For example, placing a chip shop next to a roller coast would be uneconomical because visitors will ride the rollercoaster after (or before) eating causing them to be sick on your pathways. This will require you to employ more staff on your park to clean up the sick and therefore losing you money in overheads. In order to overcome the vomit problem without employing handymen you might want to put some toilets near to the rollercoaster; remember though that toilets can be smelly and look ugly therefore disappointing your visitors. The only way to not upset visitors is to keep the toilet out of the way of the main pathway and surround it with the some nice trees and flowers. It would be impossible to go into the sheer amount of depth that surrounds Theme Park but it would be fair to say that there is a boggling amount of stuff to do in this game. Is that a good thing? Well, yes and no. Unfortunately due to the shallow tutorial system you are left to discover a lot of the techniques to succeeding through trial and error which can become a little tedious or just overly off putting. The size of the screen also adds to the “head ache” factor as at times it can be a little bit of a strain reading text. It’s well worth observing though that EA has a done a very good job considering the restrictions of the hardware; there is a lot on screen at one time during Theme Park but you really do feel in control due to the intuitive menu’s at the bottom of the touch screen. For example, installing a ride takes less then three clicks or so as you select the rides tab on the toolbar, circle the ride you want to insert and tap where you want to place it. As I’ve already mentioned the stylus isn’t wholly accurate but it is responsive enough to give a fairly accurate level of control. 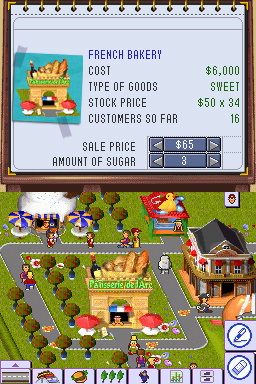 Graphically Theme Park stays true to the original providing the familiar mix of bright coloured character sprites, luscious ride designs and mix of objects and shop fronts. It’s all very cartoon-like but very nicely executed and while the statistical data at times is a little small on the DS screens, overall EA have done an excellent job converting the familiar graphic format and making it look good on the DS. Unfortunately the same can’t be said for the awfully repetitive sound loops used as backing tracks in this game. Having not played the original for a good 10 or so years I don’t particularly remember the sound however I don’t remember it being as tedious as in this conversion. There are six different tunes to choose from, each containing the same 2-or-so minutes of musical content leading to quite a frustrating ambience to an excellent game. What’s more, while the sound of several people being sick can lead you to a flaw in your park, the sound can get quite annoying as the same noise playing every second or so leads to factory-esque machinery. 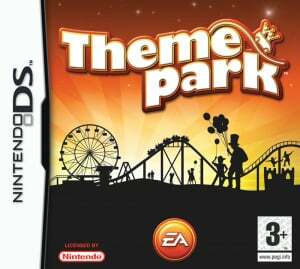 Theme Park is best played with your earphones into your iPod as opposed to into the DS. You’ll be able to share your park locally with friends by using the Nintendo DS’ wireless connectivity which is a nice addition but sadly doesn’t make up for the lack of online. Also the fact that you are only allowed to have one save file per game makes the experience of Theme Park seem very personal and a little limited at times. To be honest I was always going to recommend this game purely because it is a conversion of such a good game in the first place. While the controls are casually flawed and the sound irritating, fans of the original will find a nostalgic treat in Theme Park DS while newcomers will be thrown into a game brimming with depth. First time I played it was on the 3DO. It had all the traditional 3DO cutscenes. It was pretty sweet on 3DO. One of my early favourites from PC gaming back when I was a kid, I played this game to DEATH. It was super cool though, like Sim City but just a better subject. Got it, but eventually sold it.